2019-03-25 Good News! ICMAE basic information-call for special session and tutorial flyer are available to download here. 2018-12-21 Good News! The conference proceedings 2018 has been indexed byEI and SCOPUS successfully in three months after online. 2018-05-18 News! Welcome professor Ramesh K. Agarwal, University in St. Louis, USA, IEEE Fellow join the conference and make keynote speech. 2017-12-28 Good News! 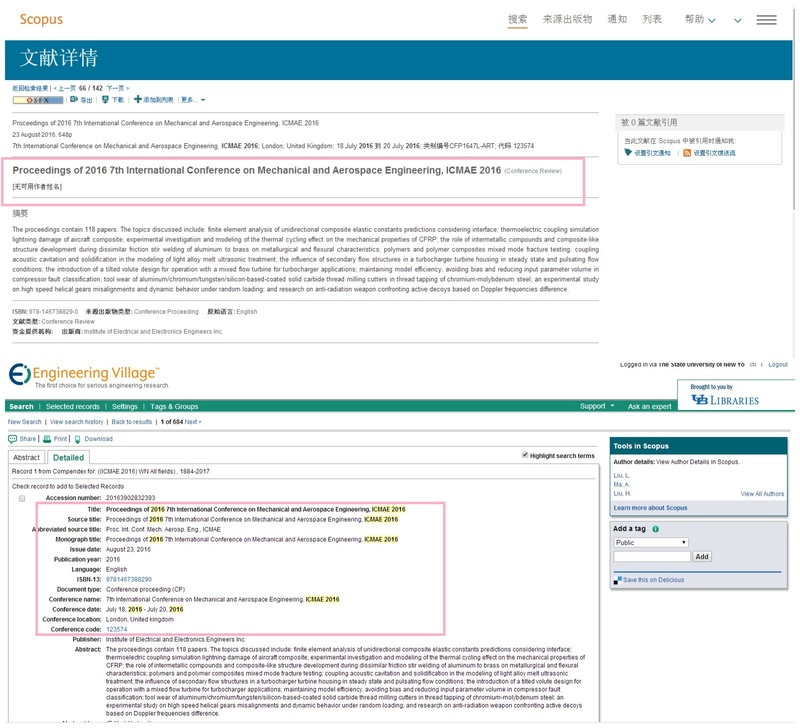 ICMAE 2017 has been indexed by EI and SCOPUS successfully within three months after online. 2017-09-15 Good News! The conference proceeding of ICMAE 2017 has been online within two months. Here enclose the online web for you to browse more details HERE. 2017-7-28, ICMAE 2017 was held in the Czech Technical University successfully. More than 250 participants join and share the latest research. 2016-11-29, Proceedings of ICMAE 16 indexed by EI and SCOPUS. 2016-10-10, ICMAE 2017 will take palce at Prague,Czech Republic, hope to meet you there. 2016-7-30, ICMAE 2016 conference closed at London, UK, Around 150 delegates joined us this year again. Apprecitation goes to the conference committee, editor, reviewers and all the participants. Conference Photos here. We look forward to welcoming you in 2017. 2016-05-07,Good News! ICMAE 2017 Conference had been listed in Sciencemeeting online, which is run by the Chinese Ministry of Education. 2016-01-21, Good News! Selected and registered papers of ICMAE 2017 will be published by IEEE Conference Publication. 2015-10-31, News,ICMAE 2017 conference website updated, we are looking forward to meeting you in London next year. 2015-10-31, News, ICMAE 2017 Calls for abstract is open now..
2015-07-28, News,More than 140 delegates this year joined July 16-17 Rome conference, thanks for all the support from committee,sponsors and delegates. More conference photos will be updated on 2016 website, which will be updated very soon. We are looking forward to meeting you again! 2015-06-17, NewsPlease download the conference program. 2015-04-10, News! The last call for paper extended to May 5th, 2015.